No more wires are needed to get to that TV in your backyard now that SunBriteTV has introduced a universal outdoor transmitter. The SunBriteTV Wireless HD Transceiver can transmit 1080p content 150 feet to any SunBriteTV via HMDI. SunBriteTV, manufacturer of the world's best-selling outdoor television, has broken the wireless HD barrier with a universal outdoor transmitter module for both residential and commercial applications. Completely weatherproof and wireless, the SunBriteTV Wireless HD Transceiver (SB-HDWT) is capable of transmitting full 1080p HD content to any SunBriteTV within range of 150 feet via an HDMI-in and HDMI-out transceiver. The peripheral device is compatible with all SunBriteTV models as well as other HDMI-featured products. "Consumers have anxiety regarding wiring and connectivity," said Tom Dixon, VP of Marketing, SunBriteTV. "The Wireless HD Transceiver makes it easy and painless for both homeowners and professional installers to send a high-definition signal to an outdoor TV--anywhere in the backyard living space." "In some instances, running hard wiring can be difficult, time consuming, and costly to the homeowner. Custom integrators now have a simple, cost-effective solution to address problem installations," said Dixon. "In that sense, this product will make outdoor TV even more accessible to thousands of homeowners." The SB-HDWT carries an MSRP of $595 and is available through SunBriteTV's Authorized Dealer Network or online at www.sunbritetv.com. 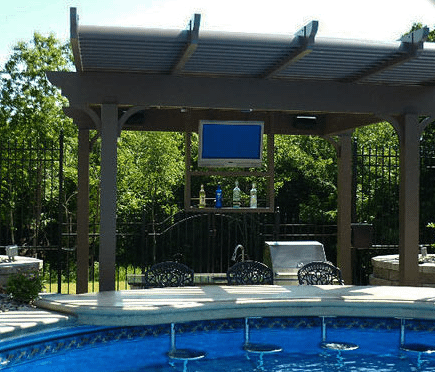 Designed for permanent installation outdoors, SunBriteTV's outdoor televisions are superior to indoor televisions when it comes to both safety and performance. Specialized gaskets and insulated electronics keep all wiring safe from every kind of natural element from moisture to insects. All models function flawlessly in temperatures spanning -24 to 122°F and feature ruggedized exteriors that can handle any climate. The bright, anti-glare screens are specially designed to deliver bright HD images outdoors, day or night. For more information on SunBriteTV please visit www.sunbritetv.com or call the sales department directly at 866.357.8688.